Manage Your Energy Not Your Time! Human Energy is a valuable resource that can contribute to the regulation of individual emotions and behaviors to achieve desired objectives. Energy can be described as the ability to get a particular work done. Furthermore, Human beings use their personal energy to perform daily activities. 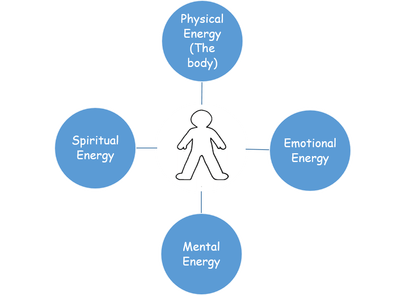 this energy derives from 4 dimensions: Physical, emotional, mental and spiritual energy. People tend to feel stress and anxiousness because daily activities demand lots of time and it is a limited resource. What people are not aware of is that PERSONAL ENERGY CAN BE RENEWED by incorporating simple rituals that will enhance the well-being of individuals. Are You Headed for an Energy Crisis? Please check the statements below that are true for you. — I don’t regularly get at least seven to eight hours of sleep, and I often wake up feeling tired. — I frequently skip breakfast, or I settle for something that isn’t nutritious. — I don’t work out enough (meaning cardiovascular training at least three times a week and strength training at least once a week). — I don’t take regular breaks during the day to truly renew and recharge, or I often eat lunch at my desk, if I eat it at all. — I frequently find myself feeling irritable, impatient, or anxious at work, especially when work is demanding. — I don’t have enough time with my family and loved ones, and when I’m with them, I’m not always really with them. — I have too little time for the activities that I most deeply enjoy. — I don’t stop frequently enough to express my appreciation to others or to savor my accomplishments and blessings. — I have difficulty focusing on one thing at a time, and I am easily distracted during the day, especially by e-mail. — I spend much of my day reacting to immediate crises and demands rather than focusing on activities with longer-term value and high leverage. — I don’t take enough time for reflection, strategizing, and creative thinking. — I work in the evenings or on weekends, and I almost never take an e-mail–free vacation. — I don’t spend enough time at work doing what I do best and enjoy most. — There are significant gaps between what I say is most important to me in my life and how I actually allocate my time and energy. — My decisions at work are more often influenced by external demands than by a strong, clear sense of my own purpose. — I don’t invest enough time and energy inmaking a positive difference to others or to the world. — How is your overall energy? What do you need to work on? Levinson, H. (2000). When executives burn out. Harvard Business Review. Loehr, J., & Schwartz, T. (2003) The Power of Full Engagement: Managing Energy, Not Time, Is the Key to High performance and personal renewal. New York, NY: Free Press. Schwartz, T., & McCarthy, C. (2010). Manage your time not your energy, not your time. Harvard Business School. ©2019 Enshape Fitness. Do Not Copy. All Rights Reserved.